Talking about spring just ahead of winter is a bit unusual. But unlike the six seasons of the year the eternal songs of Tagore know no boundary at all. So how does it matter whether the spring is there in reality or not. Ten songs composed by a young poet full of enthusiasm and deep rooted emotion portray a sense of aura about life. It’s a journey from the freshness of young love towards the profound sense of endless realization. All the songs had been composed at the beginning of the 19th century. Time has gone by but the appeal of these songs is still impeccable. They inspire us to move ahead towards the road to salvation beyond academic analysis and critical dissection. We are talking about an album, ‘Kokhon Je Basanta Gelo’, by real life couple Priyam Mukhopadhyay and Ritapa Bhattacharya. Singer Swagatalaxmi has played piano for the album. The whole album has been planned and scripted by Sumita Samanta. The album is combination of four duets and six solo songs, all belong to the category of love and devotion. But as always, here sketching line between love and separation is difficult. The album begins with ‘Gahana Kusumo Kunjo Majhe’ (within a park of lusty flowers) from Bhanusimgher Padabali. It’s followed by four solos ‘Nirobo Rajani Dekho’, ‘Tare Deho Go Ani’, ‘Sakhi Bhabona Kahare Bole’ and ‘Tui Re Basanta Samiran’. 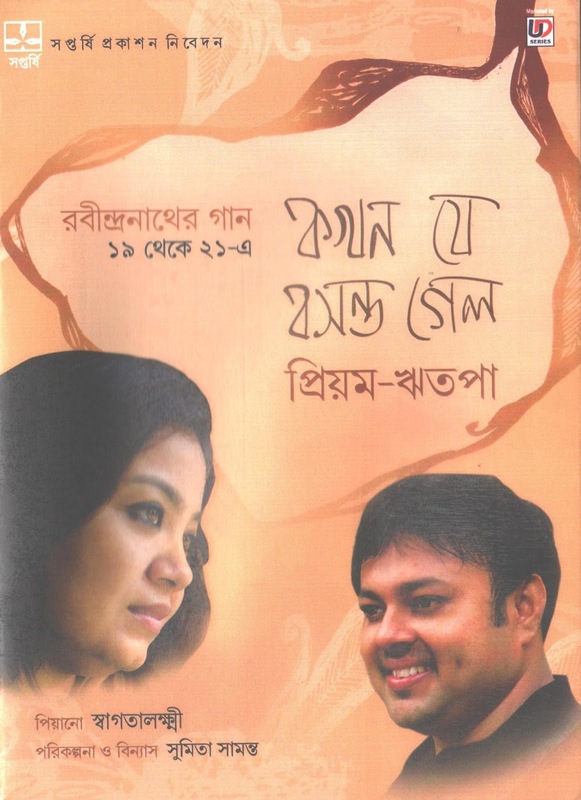 Then comes another duet ‘Sokoli Phuralo Swapana Pray’ and couple of solos—‘Aamar Praner Pore’ and ‘E Parabase Robe Ke’. The album ends with two duet songs—‘E Shudhu Oloso Maya’ and ‘Kokhon Je Basanta Gelo’. The overall arraying of the album completes the journey called love—from surge of senses to the eternal truth of life. The style of rendition of both Priyam and Ritapa is apt for the songs selected. Their real life chemistry has played a strong role in the album. It seems the two are romancing with love itself. The musical arrangement is also appropriate for the occasion and presence of Swagatalaxmi has made the album stand out in the crowd. Listeners can get overwhelmed with the concept of love as seen by the young poet. One can say that there is nothing surprisingly new in the album but like any other universal phenomenon Tagore deserves a timeless discovery. 'Kokhon Je Basanta Gelo' represents that in true sense.